Cook noodles to desired doneness as directed on package. Drain; cover to keep warm. Meanwhile, heat oil in large skillet over medium-high heat until hot. Add chicken; cook 3 to 6 minutes or until chicken is no longer pink. 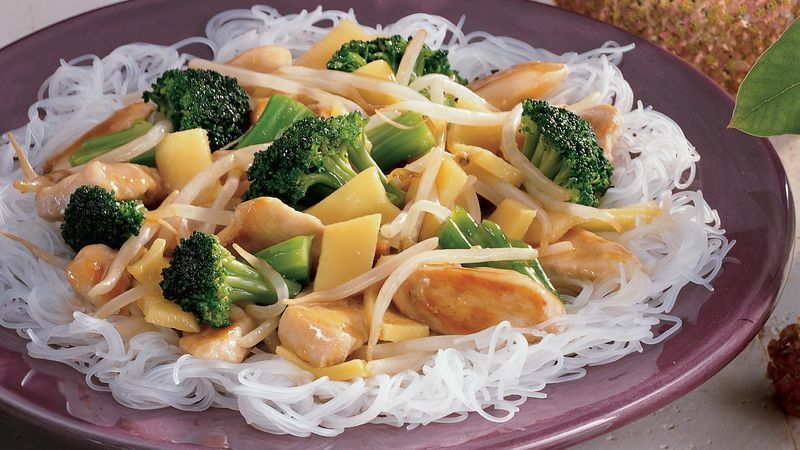 Add bean sprouts, broccoli and bamboo shoots; cook and stir about 5 minutes or until vegetables are tender. In small bowl, combine water, soy sauce, cornstarch, sugar and bouillon; blend well. Stir into chicken mixture; cook and stir until thick and bubbly. Serve chicken over hot cooked noodles.